This is a great product to use in collaboration with other JetValve products. It beats out standard bike pumps which often are too big to carry comfortably, this product does not share this issue as you won't even need a bag to carry it. 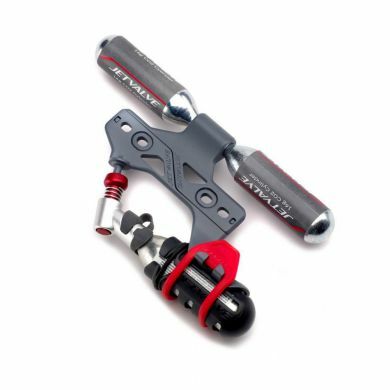 Simply attach the mount to your bike and place cartridges in place, then you're ready to go. Can carry 2 Co2 cartridges. Can also hold a 3rd co2 cartridge if attached to inflator head. Cartridge contains 16g of Carbon Dioxide under very high pressure. Cartridge contains 16g (20 Cubic cms) of Carbon Dioxide at approx 60bar/900psi. Jetvalve is a brand of UK manufacturer Weldtite who have been manufacturing bike repair kits for over 75 years. Whether you are a professional cyclist or simply enjoy riding as a hobby, you may recognise the Weldtite name. This is because we are one of Europe’s largest repair kit manufacturers. So, the next time you fix a puncture, there’s a strong chance that you will be using one of our specialist kits! So there you have it – whatever you need there’s likely to be a product in the Weldtite range that fits the bill, designed and manufactured at our factory in Lincolnshire.